I spent the first two days of Memorial Weekend a bachelor. Chris and some friends attended a surprise birthday in Las Vegas. I have been the Vegas many times and am not a fan. It is smokey, stinks and is loud. If I gambled I would tolerate the issues I noted previously. 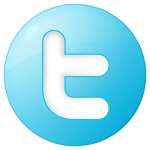 Since I am not I enjoyed a few quiet days at home. This also provides an opportunity for me to drink some wines Chris is not a fan of. 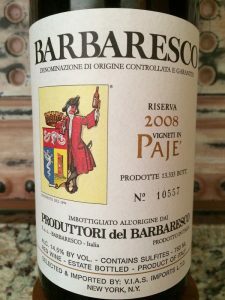 The first choice this Memorial Day weekend was a Produttori del Barbaresco Paje Riserva 2008 from Piedmont, Italy. 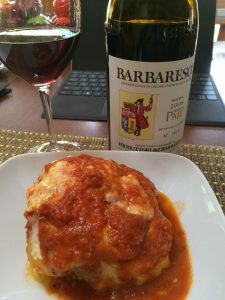 Nebbiolo (Italian), or Nebieul (Piedmontese) is a red wine grape variety predominantly associated with its nativePiedmont region, where it makes the Denominazione di Origine Controllata e Garantita (DOCG) wines of Barolo,Barbaresco, Roero, Gattinara, and Ghemme. Nebbiolo is thought to derive its name from the Italian word nebbia which means “fog.” During harvest, which generally takes place late in October, a deep, intense fog sets into theLanghe region where many Nebbiolo vineyards are located. Alternative explanations refer to the fog-like milky veil that forms over the berries as they reach maturity, or that perhaps the name is derived instead from the Italian word noble, meaning noble. Nebbiolo produces lightly colored red wines which can be highly tannic in youth with scents of tar and roses. As they age, the wines take on a characteristic brick-orange hue at the rim of the glass and mature to reveal other aromas and flavors such as violets, tar, wild herbs, cherries, raspberries, truffles, tobacco, and prunes. 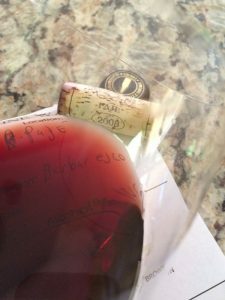 Nebbiolo wines can require years of aging to balance the tannins with other characteristics. Raspberry, cherry, strawberry, cigar box. Dry, medium-bodied with balanced acidity. Tannins were slight astringent. Rich side-mid-palate flavors with a long finish. The wine is tight and could benefit from a decanter or let it age longer. Aging: 36 months in large oak barrels and 12 months in bottle. It is a great wine to pair with food. I paired my wine with a stuffed yellow pepper. 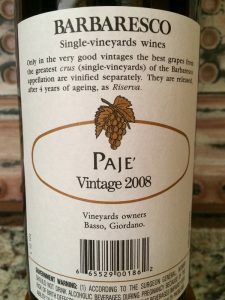 I rated the Produttori del Barbaresco Paje Riserva 2008 four glasses.